. 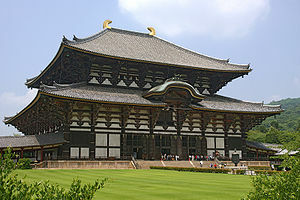 Legends - Nara Period - Introduction .
. Temple Todai-Ji 東大寺 - Nara　奈良 . 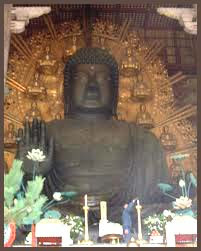 The Great Buddha Hall (大仏殿 Daibutsuden), the largest wooden building in the world, houses the world's largest bronze statue of the Buddha Vairocana, known in Japanese simply as the Daibutsu 大仏, the Big Buddha. Here are some legends ranking about this temple. 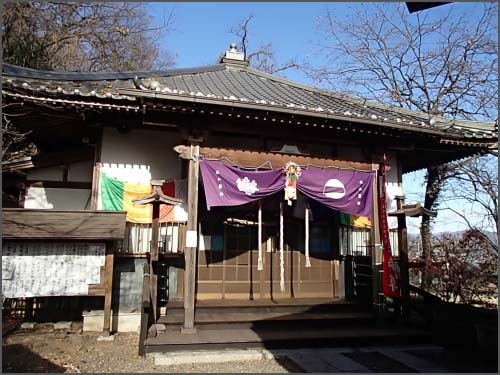 Once a man as large as the Daibutsu took the 米山薬師 Yakushi from Yoneyama on his back, set it up at 丸山 Maruyama, sat down at 金山 Kaneyama and washed his feet in the river 渡良瀬川 Watarasegawa. His straw boots became the Big and Small Maruyama 大丸山 - 小丸山. - A legend from 新潟県 Niigata about 薬師岳 Yakushidake.
. Yoneyama Yakushi in Niigata, Awagatake .